In a few hours, we are headed out into the desert on a camping trip. 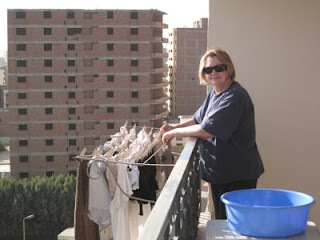 I blogged a bit about this kind of adventure last year when Linda took her "ladies tour" group out. This will be my first desert experience and should prove interesting as all ventures in Egypt do. So don't look for any new posts for the next three or so days. We went out to dinner on Pyramids Road tonight with our visiting friends. After a nice dinner at the Abou Shakra restaurant we headed over to the Radio Shack store looking for a new battery charger for our friends' video camera. After a mad dash across Pyramids, we were soon headed downtown to Mohandeseen, destination Sony Store. This would prove to be a fruitless search but interesting, nonetheless. 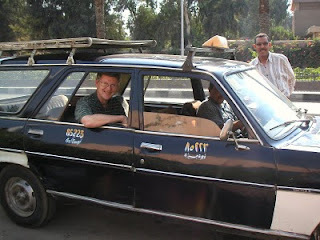 The four of us piled into one of the new checkered Cairo taxis (see previous post here for the story of the new taxis). This one was a Speranza. But what's this? Not only a working meter atop the carefully fur-lined dashboard but a working DVD player on the passenger side visor. Now as you hurtle through the streets of Cairo, you won't just have loud middle eastern music playing. You will be treated to a DVD performance too! 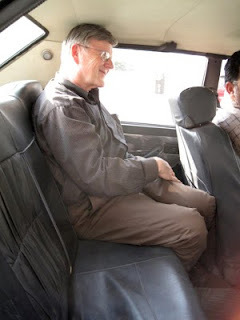 We spent about an hour and a half getting to the right area and asking a couple of dozen passersby for directions in the fashion that only someone who has ridden in a Cairo taxi would understand. We eventually found the Sony store around 11:30 and it turned out to be one of the few stores in Mohandeseen that was closed. We'll have to come back another day, with a different driver. One of our friends observed that a thrill ride at the amusement park only lasts two or thrree minutes. Our ticket tonight was good for a couple of hours! We have friends visiting us for the next couple of weeks so we will be doing many of the usual "tourist" things for a while. Yesterday was our guests' first day in the city so we let them recover from their 3:00a.m. arrival for much of the day. After that it was a trip over to the area of the Pyramids and Sphinx. That let me verify the gasoline prices. 1.75 Egyptian pounds per liter for 92 octane. 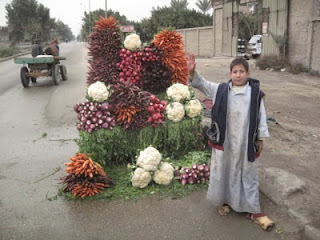 That works out to $1.22 per gallon U.S. Leaving the station we stopped to take a picture of this boy selling vegetables. 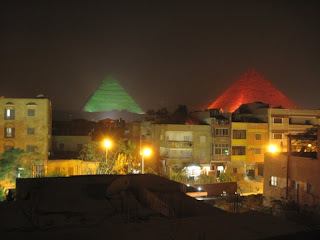 Since it was late in the afternoon we didn't actually tour the pyramids area but spent the early evening close by where we were able to see the "Pyramids Sound and Light" show from the distance. 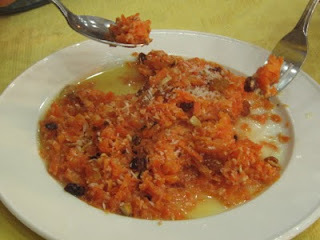 And we concluded the evening with a ride up the street to Andrea's Restaurant. 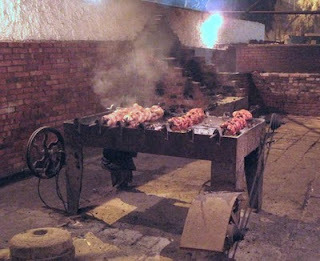 This in one of our favorite places for freshly roasted chicken. Last night marked the appearance of the Minnesota Vikings in the NFC championship game at New Orleans. With the game starting at 5:40pm Central Time, that meant a 1:40am start here. No coverage on any of the free channels on my NileSat box so I was reduced to watching the game via Yahoo Sport's live feed. For any old-timers reading this, that is a bit like reading the tape on a wire-recreation broadcast of the the Minneapolis Millers or Portland Beavers. This evening, the Egyptian Pharaohs defeated a very strong Cameroon team on a controversial (it never crossed the goal line) free-kick in overtime, 3-1. 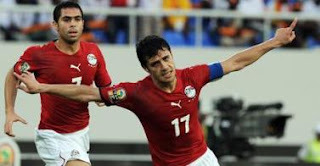 That put Egypt into the semifinals of the Cup and wouldn't you just know it, set up a match with Algeria! There are lots of Egyptian flags being sold on the street tonight. One friend called to report buying three. I'm sure the crowd is celebrating over on Pyramids Road. There are even a few cars honking and waving flags as they drive by our place. When I described our lamp purchase at the neighborhood lighting store, I mentioned that we had an invitation to come see the nearby factory. We walk a two-mile loop through the neighborhood most mornings. We have run into the lamp store owner a couple of times as he drives over to the factory. This morning, we saw one of his brothers as we were walking close to the factory, and he invited us to visit. 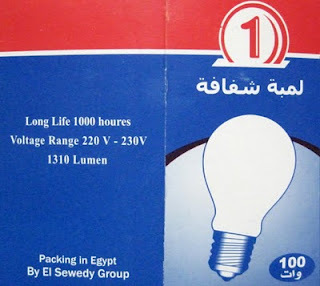 This is not a typical "show and sell" operation that you frequently find here in Cairo. You can pretty quickly tell that the factory is set up for production and not selling. No tea, for instance. And it is located on two floors of a newer building with much construction going on nearby. 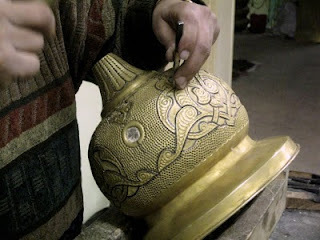 Tamer, one of the brothers, is following a pattern drawn on the brass in ink. 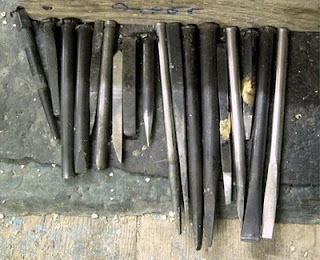 Each triangle-hole takes three blows of a tiny chisel. The lines are applied with a larger chisel. Tamer laid out some of the chisels for a picture. The family is quite a group of artisans. We give them "two thumbs up" and "four stars." Here are the brothers and their father back at the shop. This shop is one we would definitely recommend to any visitor in the area. 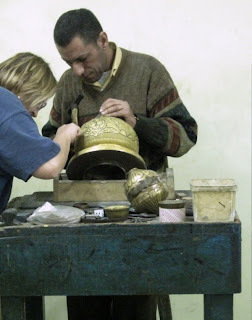 A lot of very high quality work goes into each of these lamps or other brass works. After having the electrician in to work on several light fixtures a week ago, I thought my lighting worries were all over. Alas, the story continues. I flipped on the hallway light a few days ago and there was a bright flash and then darkness. 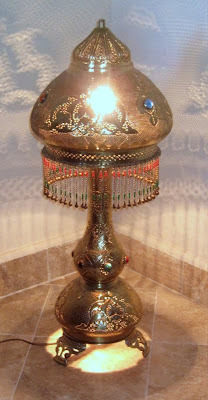 The next day, I stepped on the floor switch for that lovely new reading lamp and "pop! - crash!" the glass separated from the base and landed on the floor. Here are those two bulbs. Hey, That Taxi's a Chevy! It certainly caught my eye. I have seen very few American cars here. And a friend explains why. "Spare parts are very very expensive for American cars," he said. "And after just a few years, they stop making the parts." I can understand the concern. Another friend with a 1977 Mercedes has had no trouble coming up with U-joints, doors and other body parts as necessary in the past few years. I doubt that would be so easy for a '77 Buick. So what's with all the new Chevy taxis? Did GM Chairman Obama do a great sales job when he visited here last June? No, the story is more complicated than that. These are Chevy Lanos models. Never heard of it? Neither had I. The Lanos is a Korean Daewoo with a Chevrolet insignia on the front. The Daewoo has a decent reputation here and this is one of the five cars along with Lada, Peugeot, Speranza, and the Hyundai that are eligible for a substantial subsidy and tax break under the Cairo taxi renovation program. It's not clear to me just how fine a thread that the Lanos is hanging by since Daewoo went bankrupt, GM bought a controlling share of the company in 2002, and raised its ownership share to 70% last year. So when GM receives U.S. government money, that means... wow, that's just too complicated for me! 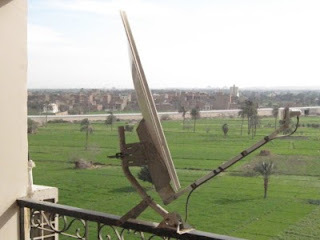 Last year I described the installation of our satellite dish here in Cairo. We were aimed at HotBird last year to pick up "European channels." But that left us without a couple of channels that the locals watch quite a bit. "What," you might ask, "is missing?" Fox Movie Channel. That is surely the number one channel watched in the homes we visit. Sure, mom might be watching Saudi Koran, but when dad or the boys get hold of the remote the channel is likely to switch over to much more secular fare. 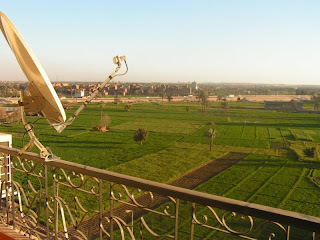 Yesterday, I took on the project of switching our balcony mounted dish over to the Egyptian owned NileSat. Not too big a project, really. Communications satellites all hang in a rainbow-like arc across the southern sky. We simply have to change the azimuth and elevation a bit to swing away from HotBird and over to the NileSat. A glance at the rest of the dishes in the neighborhood gives a good first guess since most are tuned in to the Egyptian "bird." 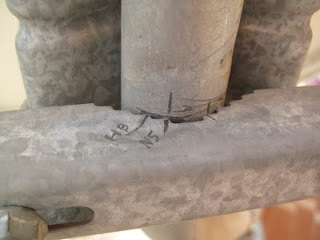 I marked the position of the dish on its mounting mast and loosened the bolts. Our Truman satellite receiver conveniently has a satellite setup screen on the menu page. It is pre-configured to know a little bit about quite a few of the direct broadcast satellites. After selecting "Nilsat," I left Linda in front of the TV with one cellphone while I took the other out onto the balcony and began moving the dish. Linda read off the signal strength to me via the phones. A couple of minutes later we had a good signal. After punching the "scan" button on the screen, we had 444 NileSat channels available. 177 are pay channels but that still leaves 267 free ones. Fox Movie channel is showing Woody Allen in "Hollywood Ending" as we speak. Last night, Fox Series aired several episodes of The Simpsons. MTV Arabia is airing Punk'd. So if you wonder where the typical middle-eastern man gets his view of life in the United State, look no farther than Hollywood. They're not watching C-SPAN on HotBird. Think "Collateral Damage" - 10:00p.m. 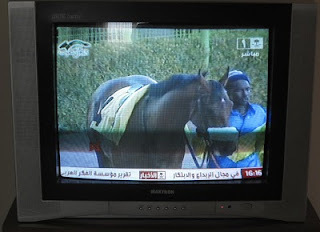 Scanning through the channels for sports and news, I settled on "Saudi 1" for a while to watch the horse races. Nile Sport, Dubai Sport - there is likely a football game on any time of the day. 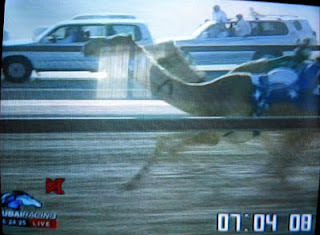 And for novelty, (to me at least) you can't beat the camel races on the "Dubai Racing" channel. 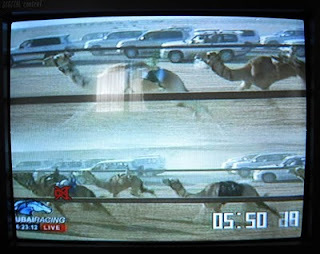 The split screen format for the camel races is a little confusing at first. One camera focuses on the leader and is shown at the top of the screen. A second camera focuses on the pack. And I really like the idea of the fans in their SUVs driving alongside to get a good look at the action. For news and the markets we've got Bloomberg, Al Jazeera International, Euro News and CNN. FoxNews and MSNBC are pay channels. If you are interested in a specific country, there are channels labeled Jordan, Sudan, Oman, Bahrain, Kuwait and Palestine. Lebanon was offering a cooking show this afternoon. 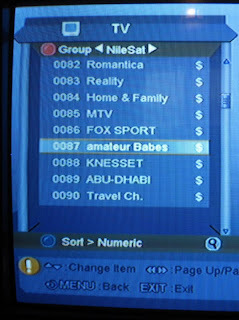 Among the pay channel lineup you can find this series: MTV, FOX SPORT, amateur Babes and KNESSET. "amateur Babes?" Who knew? I marked the position of the dish on the mast so I can find my way back to HotBird, if necessary - say, on SuperBowl night. 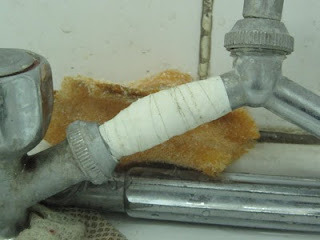 When I described the patch to our toilet line being made with plaster, you might have wondered, "what other innovative techniques have the Egyptians developed for dealing with leaks?" Where is Billy Mays Mighty Putty when you need it? We were downtown with friends last Friday and stopped at a lighting store in an area that is quite a bit more "upscale" than out here by the pyramids. Our friend was shopping prices for some new lighting. I found a nice modern fixture that I thought would make a good reading light. 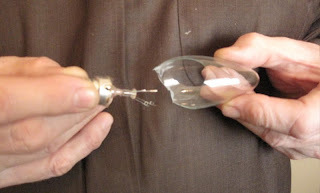 We carefully inspected the fixture and globes in the store, paid the marked price and brought it home. There is another lighting store just up the street from us. I call it "Lamps r Us." This one is mostly lamps but has a few other furnishings, too. Last year it was only open by appointment but this year it seems to have something close to scheduled hours. Linda had arranged for an opening last year and found an attractive lamp but we didn't buy it. We went over a couple of days ago to check out the wares. It turns out that the owner has his own lamp factory and is in business with his three brothers. 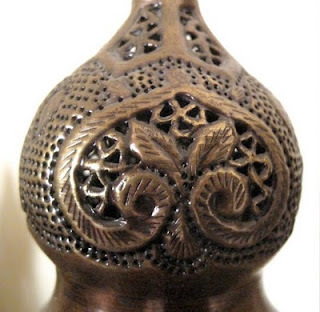 They learned the trade from their father who began pounding brass and copper into lamps many years back. 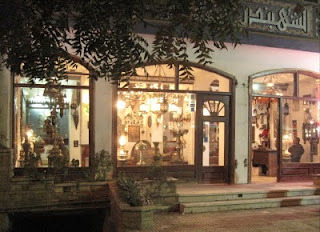 Many of the lamps at Kahn al Khalili bazaar come from their factory. Think "Factory Outlet" - right here on our street! No quick purchase here. Tea, conversation, prices, deal! We bought these two traditional style lamps. I'm told that the one on the left is based on an "ewer," not the "water jug" I thought it was. It appears to be a quality piece, weighing in at around thirteen pounds. The shop owner lives nearby and we have been promised a factory tour. We discovered two new restaurants on our daily walk. Well maybe not really two. 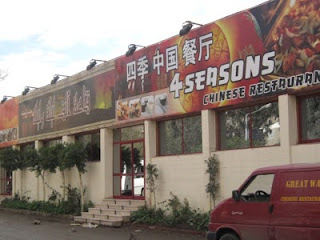 We first spotted this building with a sign noting the 4 Seasons Chinese Restaurant. Placing those stones in the street marks the no-parking area. What caught our interest was the left side of the building. 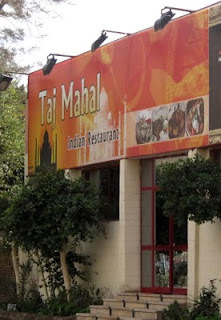 The Taj Mahal Indian Restaurant. So we returned in the eveing for dinner. There is a common kitchen for the two restaurants. The cook is Chinese. The Chinese side has an extensive menu but the Indian side was only serving a "fixed menu." We opted for the Indian cuisine. We must have missed the crowd. The Indian side could hold about two hundred patrons, mostly at tables for twelve, just as on the Chinese side. We were the only customers. So I can't give any stars for atmosphere. It was also a bit less than chilly - even Linda says it was cold. But the service was definitely four stars and the food was fine. Many of the gasoline stations here have familiar names. But one of the more popular brands seems to be the CO-OP. And I couldn't help but notice that there are times when the local CO-OP station has very long lines - many of the vehicles being the older black and white taxis. It took a while to find out why. Gasoline here is available in 90, 92 and 95 octane ratings. 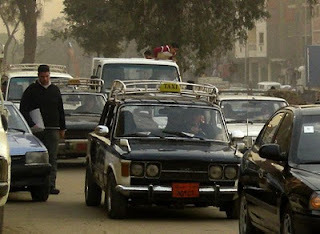 The 90 octane runs about 1.5 Egyptian pounds per liter. (I say "about" because I have been told 1.3, 1.5 and 1.6 by friends in the past two weeks while a published report quoted 1.75 - nothing is black and white here except the taxis!) The prices are set by the government. That translates to about $1.04 per gallon. But there also is 80 octane gasoline available. 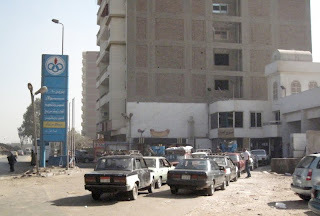 The price for that is only 1 Egyptian pound per liter or 70 cents per gallon. CO-OP is one of the two government run suppliers for fuel. When a batch of 80 octane is available, word gets around. Aha! That's why our taxi drivers frequently pull into a station and add gas. This report from EgyptOil-Gas reports that current government subsidies for gasoline prices are running about a billion dollars a month. This report from about a year ago says that 80-octane gasoline has increased to about a 45 percent share of the market. Imagine that, subsidizing a product to keep the price low results in increased demand. Who'da thunk it! Of course, 80-octane gas might just blow the heads off any engine higher powered than a 1970 Russian Lada. But that's probably best left for discussion on someone else's auto-blog. 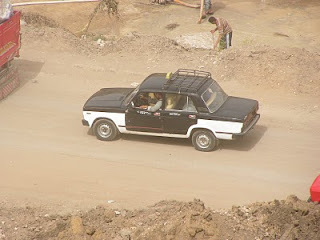 In years past, one of the first things visitors to Cairo would notice was the taxi fleet. The small black and white taxis are everywhere. Especially when it comes to leg room. Under a law passed earlier this year, the authorities will not renew the licenses of any taxis older than 20 years, which may be the majority on the clogged, polluted streets of Cairo. 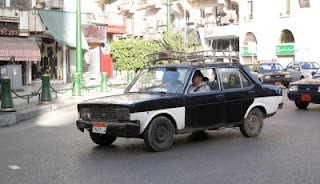 The fleet of Russian-made Lada 1300s, Cold War-era Romanian Dacia 1300s and Turkish Sahins may not rule the streets much longer in Cairo, where passengers pay what they wish for a ride in the meter-less contraptions. This year, we have ridden in a couple of the new checkered pattern cabs, like this one. I was more than shocked to find the meter working in a taxi. 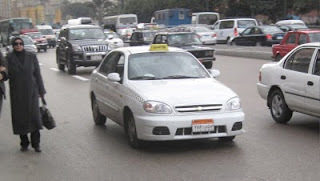 Negotiating a price for a taxi ride is a big part of the Cairo tourist culture. Ten pounds, about $2 will get you a two mile ride under most circumstances. The meter yields the same result but with a lot less fun. 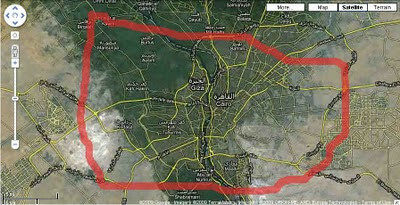 Here are a couple of maps borrowed from Google that show the areas of Cairo where we visit. This first one will give you an ideal of the size of the city. That red line is the Twin Cities 494-694 loop drawn to the same scale and placed on Cairo and suburbs. Cairo proper is said to have about six million residents with the total metropolitan population figure usually given some number from 16 million to 25 million. THis map is centered on the downtown area with the pyramids lying just about on the red line at the lower left. Those "suburban" areas out in the desert are 6th of October City and New Cairo. Here's a closer view that shows the areas we frequent. 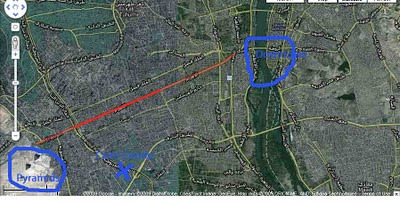 The left circle shows the pyramids, about two miles away from us and the right circle shows the downtown area about four or five miles to our northeast. That red line is Pyramids Road, one of the most heavily traveled streets in the area. The downtown area is the location of most high-end tourist hotels, such as the Hilton, Sheraton and Marriott. Shopping areas, government buildings and the Opera House are found there. 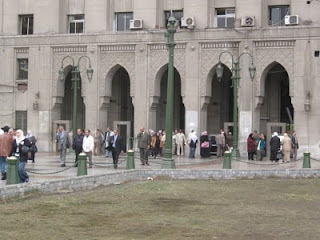 Mugamma Mugamma, literary meaning ‘combined,’ is Egypt’s government office complex located on the south side of Midan El Tahrir in Cairo, Egypt, where all the paperwork is done. It’s a twenty story tall building with narrow hallways, unlabeled doors and a billion people (seemingly) all shouting at the top of their lungs trying to get their paperwork done at the many government agencies located in this one building. The agencies there include the Fire Fighting Organization, the Tax Evasion Investigations Offices, the Passport Offices and the High Committee for Sports and Youth, as well as many others. This is where one goes to get a marriage license or a driver's license, or for that matter, most any other license one can imagine. 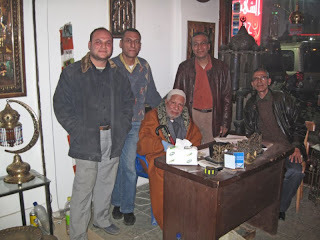 If one has business of almost any kind to transact with the country of Egypt, this is the place. If you are thinking "Soviet-style," when you see the pictures, you are correct. 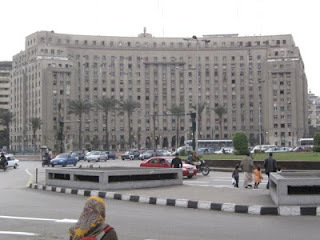 The building was a fraternal gift from the Soviet Union to the Egyptian people in the early 1950s. We headed for the 1st floor (one floor above the ground floor) and passed through the second set of metal detectors. There are 56 numbered and labeled windows for trasacting business on the "visa end" of the first floor. We started out at window 38 labeled "Tourist Res. Processing" and were quickly directed to window 12 to pick up the correct form. The lady at window 12 gave us a form and a few directions. The four page form is about 9" x 14" and asks for passport number, birth date and a few other items. Not knowing how specific to be, I supplied "Christian" for my religion. We already had photos but needed copies of our passports and current visas. That meant a trip downstairs to the photocopy service. Linda elbowed her way to the front of the line. One pound apiece ($0.18) to the copy lady and then we headed back upstairs. The next stop was window 43, "Fees and Stamps." We each got four pretty stamps for a total of 23 pounds($4.24). Back to window 12. It is winter here so each of the clerks had a leather or wool coat on. Ours was topped out in a wool hat over her scarf. I'd say the temperature was in the mid 60s in the building. The lady took our applications, stapled the photos to them, applied the four stamps in the assigned area, placed the photocopies inside the forms, handed off the forms to one staff member and the passports to another. "In two hours, Window 38!" she said. Two hours is easily passed downtown. We returned to window 38. No need to ask any questions. Our passports were quickly pulled from the stack and handed to us. We can stay until July 3rd, if we choose. With any luck, the snow will have melted in Minnesota well before that. With power available at the washing machine it was time to try out the Zanussi Ideal! Being a cautious soul, I suggested that Linda might want to stay close to the machine during the first load. She grabbed her reading material and brought in a chair. We're not used to the front-loading machine and didn't know what to expect. We watched. We waited. We watched some more. The watching is quite interesting, at first. A few slow turns to the right. Pause. A few slow turns to the left. Repeat. No water spewing forth from anyplace. Well, that's why we were watching. 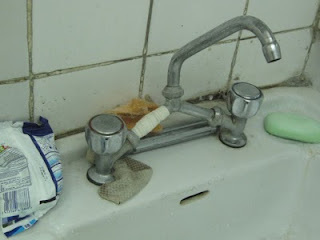 We seemed to be conserving lots of water. 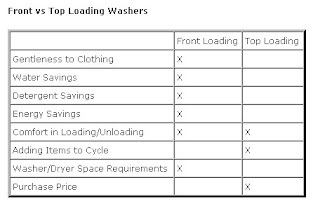 This website has a nice summary table of front-loader versus top-loader. But no mention of cycle length. I had plenty of time to browse the "inter-tubes" while we waited for the machine to finish that first load. Two hours and eight minutes to be precise. Is this normal? I notice that the question has come up before. For example, at this site. "Front load washer cycle time - is 115 minutes normal?" So there's something to add to your questions the next time you buy a washer! (Added later) And we haven't talked about vibration yet. Here is a discussion thread that notes, "Think Sikorsky helicopter hovering in the laundry room!" A fair description in some cases. And don't think you are going to stop the cycle and redistribute the load with a front-loader either! 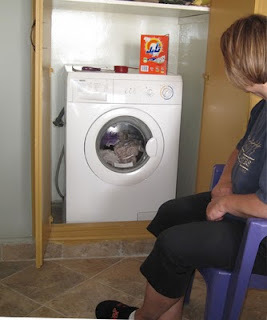 With the wash finally done, Linda loaded the dryer and we headed out to dinner.